I stamped out several flowers onto a piece of lightweight white card, with black Archival ink. 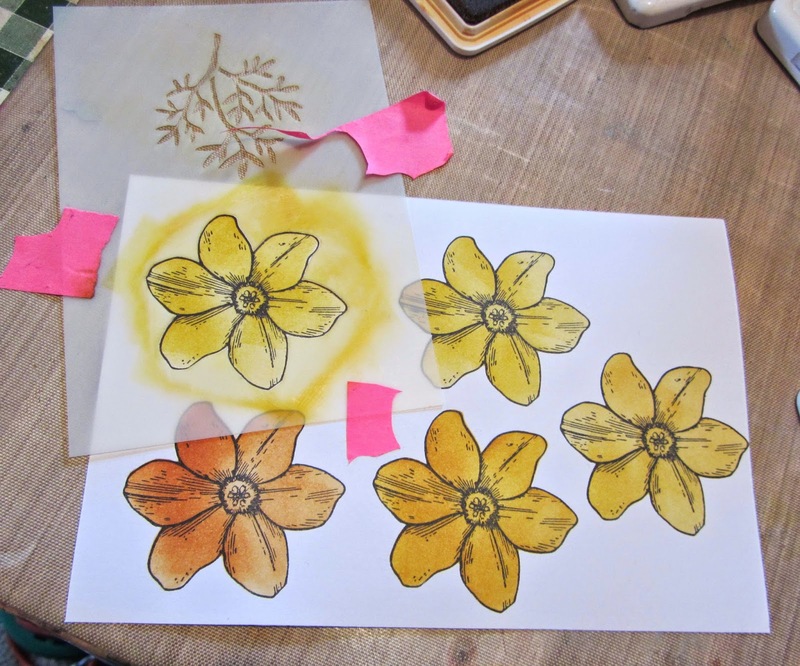 I gave them a quick blast with my heat tool before overlaying the stencil and colouring the flowers with Archival inks, applied with a blending tool. I used some snippets of Post Its to hold the stencil in place. 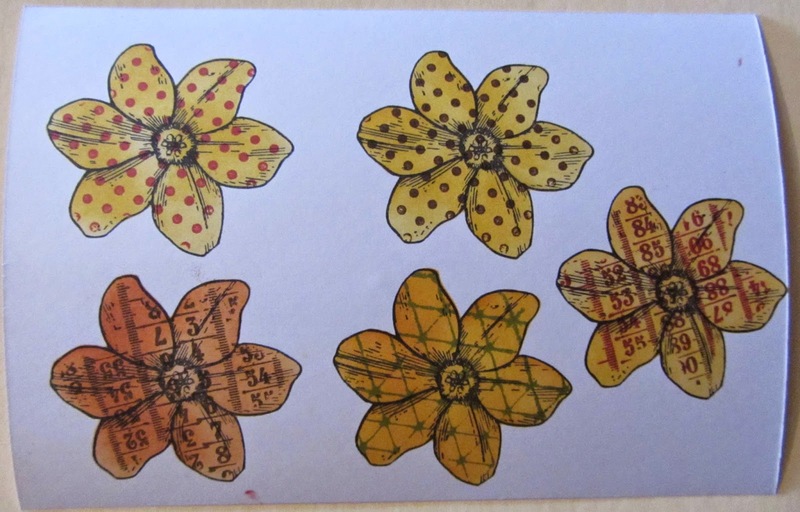 Still using the stencil, I stamped over the flowers, with various background stamps from my stash, in true Wendy style. Once again I set the inks with my heat gun. My next task was to cut out each flower and adhere them to a piece Wendy's Clearly for Art modelling film. This was for me, totally experimental. I used Helmar-450 Clear adhesive, and wasn't at all sure what would happen when I applied heat! 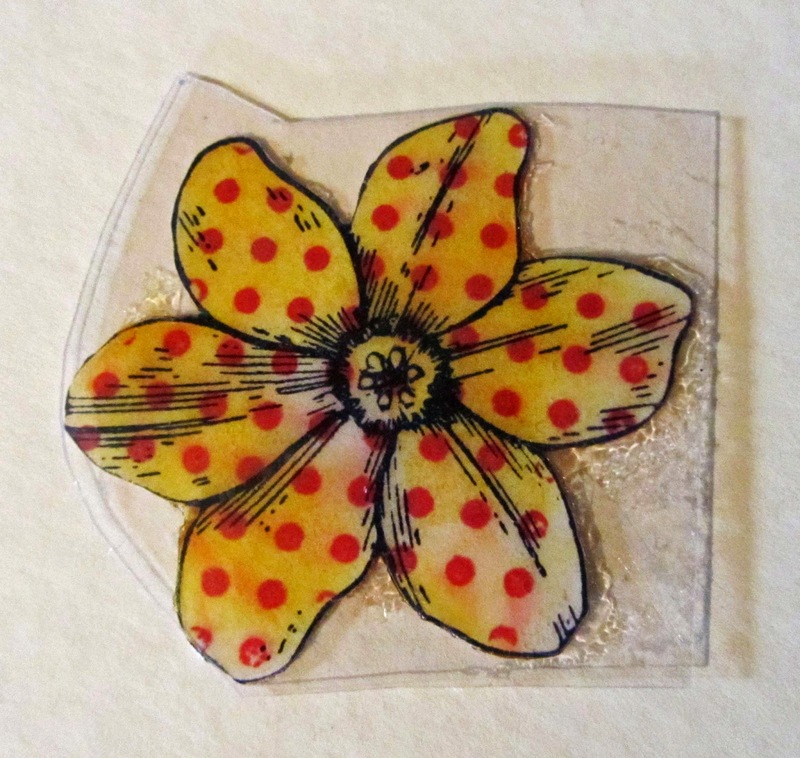 I adhered the Clearly For Art transparent film, to the back of each flower and cut them out. I then adhered another piece on the top and really pressed down to spread the glue and remove any air pockets, I used a soft cloth and a burnishing tool. This didn't seem to affect the Clearly For Art, I thought it might leave scratch marks but it's very resilient. After trimming around the flowers for a second time, I heated each one separately, and moulded the petals. I could see the glue bubbling slightly with the heat but I just pressed down on the surface to smooth it out. If you look very closely,you can see a feint patterning from the glue, but it looks like a bit of spritz and flick, intentional? of course it is! I added some vintage pearls, studs and crystals to decorate the flower centres. I used a small hand punch to make holes in the flowers so that I could link them together with jump rings. The chain was salvaged from my stash of 'junk jewellry'. I often buy bits and bobs from second hand or cheap shops. If you'd like to have a go at something like this, you can find many of the supplies I've used in Kim's Fabulous eclectic Paperie shop. Click on any of the thumbnails below to be transported straight there. Oh! and don't forget there's still time to join in with the ePlay Challenge the subject is 'Wood' and full details can be found on the eclectic Paperie blog. There are some wonderful entries! Absolutely GORGEOUS, Toni! LOVE the flowers and the technique and it made such a Pretty necklace! Very cool Toni! 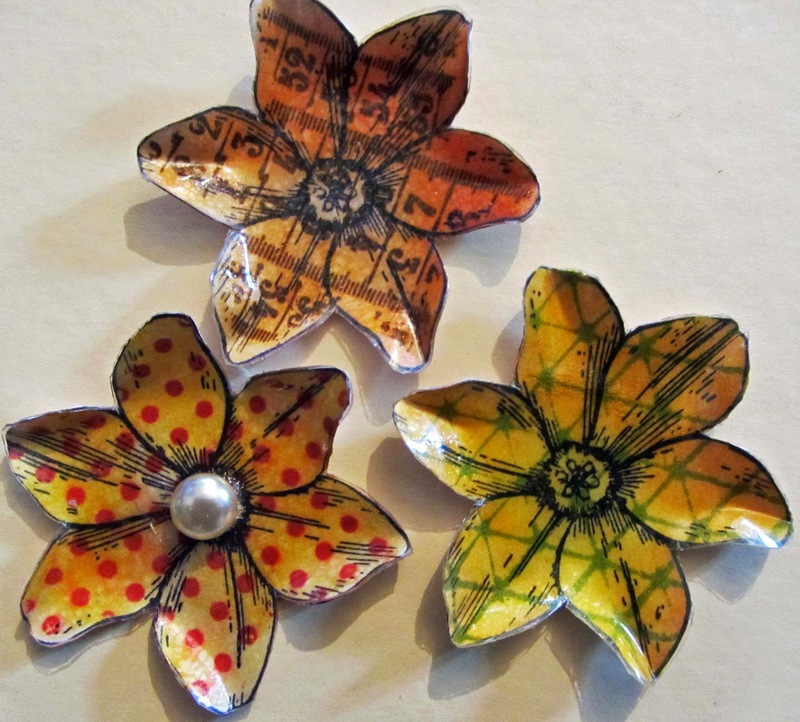 I just love all the differet stampings and colors you used on your pretty blooms! This would certainly be the bright spot of an outfit! adorable, fun and so cute! I love the technique. I will have to try this! Wowsers Toni, that necklace is drop dead gorgeous. Absolutely love it. Absolutely gorgeous, Toni - what a fabulous way to use the flowers! 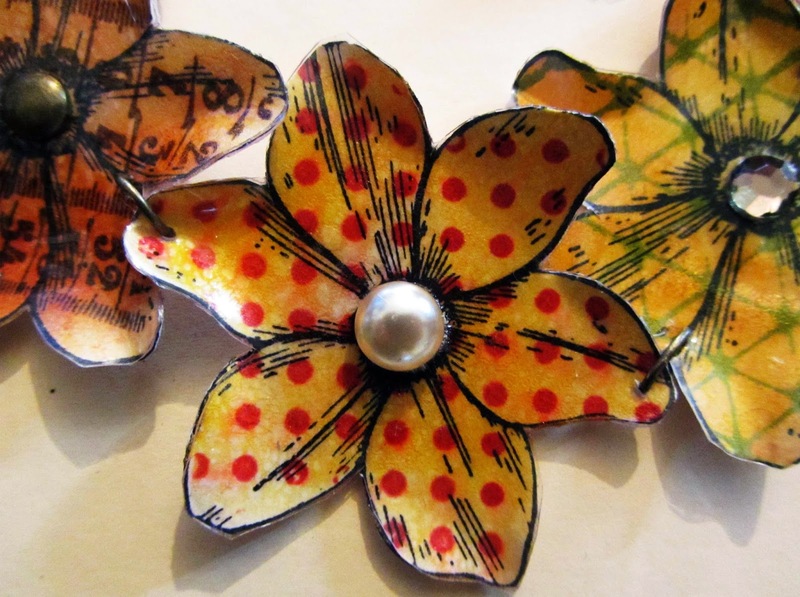 Wearable art - I love it! 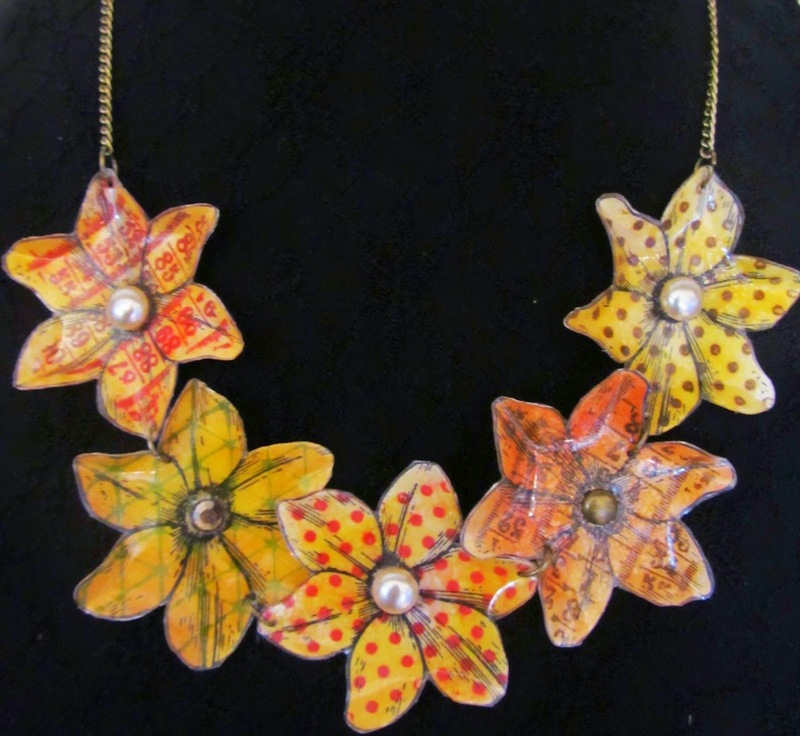 Gee, Toni, what a fantastic idea to make a necklace with these great flowers and Clearly for Art!! It's wonderful! !